Heat exchangers on board ship are mainly coolers where a hot liquid is cooled by sea water. There are some instances where liquid heating is required, such as heavy fuel oil heaters and sea water heaters for tank cleaning. Although being heat exchangers, the main condenser for a steam ship and the evaporator/distiller are dealt with separately . The heat exchange process is accomplished by having the two liquids pass on either side of a conducting surface. The heat from the hot liquid passes to the cold liquid and the conducting surface, i.e. the tube wall, is at a temperature between the two. It is usual for marine heat exchangers to have the two liquids flowing in opposite directions, i.e. counter or contra flow. This arrangement provides a fairly constant temperature difference between the two liquids and therefore the maximum heat transfer for the available surface area. Coolers at sea fall into two groups, shell and tube type coolers and the plate type. Both are considered below. In the shell and tube design a tube bundle or stack is fitted into a shell . The end plates are sealed at either end of the shell and provision is made at one end for expansion. The tubes are sealed into the tube plate at either end and provide a passageway for the cooling liquid. Headers or water boxes surround the tube plates and enclose the shell. They are arranged for either a single pass or, as in Figure below, for a double pass of cooling liquid. The tube bundle has baffles fitted which serve to direct the liquid to be cooled up and down over the tubes as it passes along the cooler. The joint arrangements at the tube plate ends are different. At the fixed end, gaskets are fitted between either side of the tube plate and the shell and end cover. At the other end, the tube plate is free to move with seals fitted either side of a safety expansion ring. Should either liquid leak past the seal it will pass out of the cooler and be visible. There will be no intermixing or contamination. 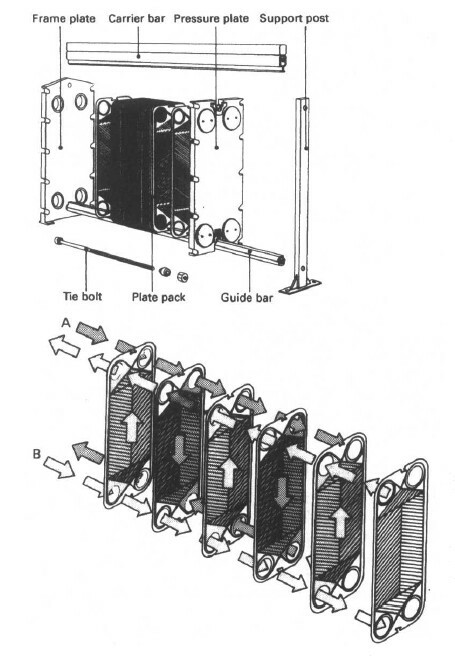 The plate-type heat exchanger is made up of a number of pressed plates surrounded by seals and held together in a frame . The inlet and outlet branches for each liquid are attached to one end plate. The arrangement of seals between the plates provides passageways between adjacent plates for the cooling liquid and the hot liquid . The plates have various designs of corrugations to aid heat transfer and provide support for the large, flat surface. A double seal arrangement is provided at each branch point with a drain hole to detect leakage and prevent intermixing or contamination. Temperature control of coolers is usually achieved by adjusting the cooling liquid outlet valve. 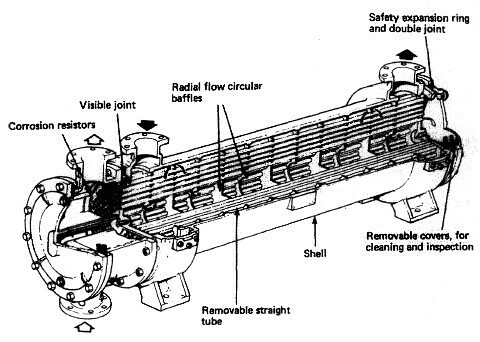 The inlet valve is left open and this ensures a constant pressure within the cooler. This is particularly important with sea water cooling where reducing pressure could lead to aeration or the collecting of air within the cooler. Air remaining in a cooler will considerably reduce the cooling effect. Vents are provided in the highest points of coolers which should be opened on first filling and occasionally afterwards. Vertical mounting of single pass coolers will ensure automatic venting. Positioning the inlet cooling water branch facing downwards and the outlet branch upwards will achieve automatic venting with horizontally mounted coolers. Drain plugs are also fitted at the lowest point in coolers. Clean heat transfer surfaces are the main requirements for satisfactory operation. With sea water cooling the main problem is fouling of the surfaces, i.e. the presence of marine plant and animal growth. With shell and tube coolers the end covers are removed to give access to the tubes for cleaning. Special tools are usually provided by the cooler manufacturer for cleaning the tubes. The end covers can also be cleaned. Tube leakage can result from corrosion. This can be checked for, or identified, by having the shell side of the cooler circulated while the cooling water is shut off and the end covers removed. Any seepage into the tubes will indicate the leak. It is also possible to introduce fluorescent dyes into the shell-side liquid: any seepage will show under an ultraviolet light as a bright green glow. Leaking tubes can be temporarily plugged at each end or removed and replaced with a new tube. Plate-type coolers which develop leaks present a more difficult problem. The plates must be visually examined to detect the faulty point. The joints between the plates can present problems in service, or on assembly of the cooler after maintenance. Where coolers are out of use for a long period, such as during surveys or major overhauls, they should be drained on the sea water side, flushed through or washed with fresh water, and left to dry until required for service. Copyright © 2010-2016 Machinery Spaces.com All rights reserved.